I threw a dinner party for the record books last weekend. In hindsight, I should have seen the writing on the wall from the get-go. I broke my cardinal rule and got a late start cooking. But it was one of those days at work when nothing was going right and everything was taking twice as long as it should. So I literally sprinted to the kitchen, just a couple of hours ahead of the guests. Evidentially my terrible, horrible, no good, very bad day karma carried right on over into the kitchen. It took me two attempts (yes, two) to realize I was feebly trying to crack hard boiled eggs into the mixing bowl instead of soft. Once I finally got my hands on the right carton of eggs though, there was no stopping me. I got so carried away with my success that before I knew it, I had aded too many whites to the coconut macaroons. As if to somehow compensate for this, I left out the salt entirely. My carrots that were supposed to be chilling in an ice water bath to prevent sogginess ended up sitting out at room temperature all day. I should learn to listen to myself better. Especially in times of duress. I had somehow managed to take a quick break earlier in the day to get the naan – that soft, oven-baked Indian flat bread prepped and rising. Midway through my workday, I remembered with a jolt that naan was to accompany the menu of spicy chile-cilantro grilled chicken and curried rice. I went downstairs to the kitchen and got it going with what I thought was going to be perfect timing. But it was particularly cold out, which means I felt the need to keep the house particularly warm. Which means the naan rose particularly fast. No worries, I thought. I’ll just punch it down again. Striving yet again for the perfect timing that would allow me to pop the breads into a 500ºF oven just minutes before sitting down at the table, I decided to give the dough a little goose of warm air by sliding the covered bowl gently behind the wood stove. You know how sometimes things happen so fast you don’t actually know how they transpired? It was all in the timing. Mark stepped out on the deck to check the grill. I popped upstairs to get some extra stemware out of storage. Enter Mae West – our dog. With unprecedented deftness, she ate the entire bread bowl full of rising dough. I can’t say for certain, but I’m pretty sure I was more distraught over what this was going to mean for the dog than I was about there being no naan for dinner. But before I had time to really mull it over, our guests arrived. Our friend Linda, bless her heart, had her phone out before we could even finish telling the tale. She was calling her brother-in-law veterinarian in Reno, NV. David got the specifics, asked a few pertinent questions, and then advised that we induce vomiting. I got Linda set up at the bar taking drink orders while Mark, Mae West, and I proceeded out into the frigid darkness with a bottle of hydrogen peroxide and a turkey baster. We were only mildly successful with our attempts and West spent the remainder of the evening outside on the deck with a sort of woeful look on her face. The beauty of having true-blue friends over is that they’ll excuse just about anything. And that they did. Dinner got on the table at least 2 hours later than planned. I rummaged through the freezer and found an assortment of odds and ends bread products to serve. The grilled chicken (thankfully) was glorious. The thick chile-cilantro marinade formed a crunchy, spicy crust that was a perfect warm-up for a cold night. The shredded carrots rallied, got themselves dressed up in a tangy sauce with dates and pistachios and seemed no worse for the wear. Everyone claimed to like the “extra chewiness” of the macaroons, but really I think they were just being kind. The dog came in as our friends departed and headed straight upstairs to bed. We all survived, I sighed, crawling underneath the quilts. I drifted off and awoke in the wee hours of the morning to the sound of someone doing body slams against the floor. I wearily checked on the dog and came to the stellar conclusion that she must be highly uncomfortable. It wasn’t until a few hours later when we were all up and about that we discovered the pooch was down and out drunk. She’s a big girl, but apparently not big enough to stave off the effects of a pool of fermenting yeast in her belly. (It was then that I remembered adding an extra hefty pinch of yeast to the dough – skeptical about its freshness.) Mark carried all 67 pounds of her down the spiral steps where she then proceeded to walk headlong into the wood stove. Back to the scene of the crime. We tried to get her quiet and comfortable – her poor head bobbing and weaving, even as she laid still. We got a local vet on the phone over coffee and learned she’d just have to sleep it off. Which is about what I felt like doing. Whisk together the yogurt, water, honey, and salt in a large bread bowl. Beat in the egg and melted butter and mix throughly. Sprinkle in the yeast. Give the yeast about five minutes or so to activate and bubble, and then stir in the flour. I use a firm plastic spatula to work in the flour. The dough is quite sticky at first. I keep kneading with the aid of the spatula blade until a less sticky dough ball begins to form. 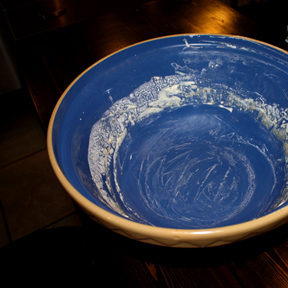 I then lightly oil my hands and switch to kneading by hand (in the bowl) until a smooth ball forms. All in all about 15 minutes. Lightly oil the bowl, cover, and let it raise undisturbed in a warm spot (free of dogs) until doubled in size – about 2-4 hours. You can punch the dough down and give it a shorter second rise if need be. Punch down the dough and then gently knead for another few minutes to loosen it up. If you are using garlic, knead it in at this stage. Divide the dough into 8 equal portions and roll out each piece into about a 7-inch oval. Arrange in a single layer on 2 baking sheets and bake in a 500ºF oven until they begin to puff and brown – about 4 to 5 minutes. Remove and brush with melted butter if desired. Serve quickly! Naan is great with curries, tandoori dishes, kebabas, and soups. It’s also quite tasty for breakfast with a smear of butter and honey – especially the garlic naan.